Following some food, a curious young sparrow stows away in the back of a truck and takes an unusual voyage south — through the lush rice paddies of India, across the rough sea, and all the way into a bright new day. As the sun rises high over the city, he finds little Edie at a café with her grandma and granddad, and for a fleeting instant, his world meets up with hers and changes her life in the most delightful way. From the masterful Bob Graham comes an invitation to notice the smallest of moments as they unfold around us, full of unexpected promise. Bob Graham, Australia’s leading picture-book maker, has written and illustrated many children’s picture books including Oscar’s Half Birthday, Buffy and Let’s Get a Pup. 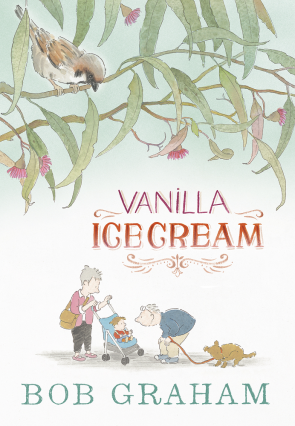 He won the 2000 Smarties Gold Medal for Max, the 2003 Kate Greenaway Medal forJethro Byrde, Fairy Child and the Australian Children’s Book of the Year Award an unprecedented four times. His recent books include the early reader, Jack’s Little Party and My Dog, My Cat, My Mum and Me! with Nigel Grey.